Piano trio / Matthew Hindson. Performance by Benaud Trio from the CD Works by Kats-Chernin, Greenbaum, Bodman Rae, Yu, Cockcroft, Hindson. Difficulty: Advanced — Professional (though some movts amateur). i. Moto perpetuo -- ii. Repetitions -- iii. Epic diva. Commissioned by Macquarie University for performance by Macquarie Trio with funds provided by Australia Council. N.B. The piano part in this set is a copy of the full score. Score: Piano trio / Matthew Hindson. CD: Works by Kats-Chernin, Greenbaum, Bodman Rae, Yu, Cockcroft, Hindson. 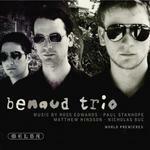 CD: Benaud trio / music by Ross Edwards, Paul Stanhope, Matthew Hindson, Nicholas Buc.